The Aristocats is a 1970 animated feature produced and released by Walt Disney Productions. The twentieth animated feature in the Disney animated features canon, the story revolves around a family of aristocratic cats, and how an alley cat acquaintance helps prevent a butler from kidnapping them to gain his mistress' fortune. The Aristocats noted for being the last film to be approved by Walt Disney himself; he died in 1966, while Aristocats film was still in early production. It was originally released to theaters by Buena Vista Distribution on December 11, 1970. The title,Aristocats, is a pun on the word aristocrats. Remember every time you purchase Aristocats artwork over $995, shipping is FREE in the continental U.S. and there is NO SALES TAX when you purchase outside of Colorado. 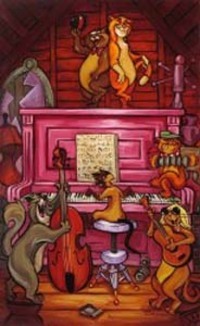 We SHIP WORLDWIDE and offer Layaway for Aristocats art.